No, it's a fact top tier air coolers cool as well as CLCs at same noise levels as long as they are supplied the same temperature of air. Several years ago PC-Cooling tested Silver Arrow SB-E (comparable to other top tier coolers but 17cb quieter) H100 (comparable to other 240mm radiator CLCs) and Silver Arrow SB-E Extreme (similar noise level to CLCs like H100) with open bench test station so all were using same temperature of air. Air cooling running 17dB quieter was only 1c warmer and when runnng 1dB louder air cooling was 8c cooler. Silver Arrow SB-E Extreme is 7c cooler with fans making similar amount of noise as H100 does. True, but it's one easily resolved with only a little knowledge of what to look for. Most cases only need a fan or two added to have good airflow. It's not rocket science and only requires a couple minutes of reading to know what is needed. 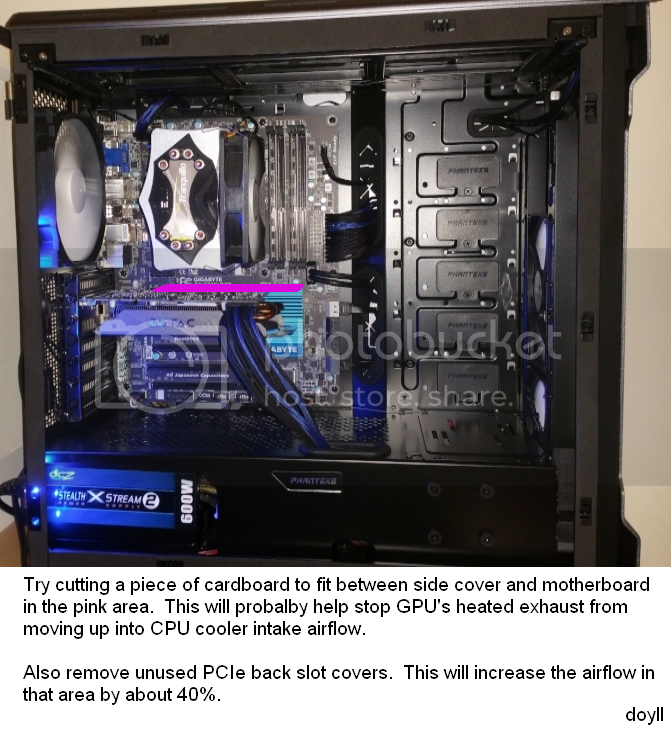 Below is link to basic guides for how airflow works and how to setup case airflow. With CLCs is more often user mounts it as intake then brags about how much cooler CPU is .. but never mentions GPU and other component temps are often 2-6c higher. No, there are not fewer fans, CLCs add an additon of 2x 120mm / 2x 140mm fans mounted on radiator that are also functioning as additional case fans. Yes, there are a few cases/builds that will not work with anything but CLC, AIO or small custom loop, but they are the exception, not the rule. As for neater many of use thing the 2 black snakes are much uglier than a good air cooler. Just look at obitalwalsh post #48 to seen what I mean about black snakes. Sorry, orbitalwalsh, you have a nice cool system but it definitely is not neat and tidy. CLCs are definitely not quieter than air cooling. There is almost always some pump and coolant noise invovled at idle that does not exist with an air cooler. CLCs are also not more efficient than air coolers, neither in performance or in costs. Air cooling cools as well or better, is more dependable/lasts longer, and is lower cost. I think I've said all I need to. This is getting odd now. Btw, Doyll, I know quite a bit about airflow. I've been at this game for 20 years including 2 years working as a bench tech. I've seen your advice over the years, including telling someone to place a piece of card between their GPU and CPU cooler to improve temps. Btw, Doyll, I know quite a bit about airflow. I've been at this game for 20 years including 2 years working as a bench tech. I've seen your advice over the years, including telling someone to place a piece of card between their GPU and air cooler to improve GPU temps. Card from front of CPU cooler to front of case between front intake fans and from motherboard to side of case blocks and thus stops the heated exhaust air coming off of GPU from moving up and mixing with cool intake air moving back to CPU cooler. Also removing PCIe back slot covers from case almost always improves GPU temps by increasing rear vent area around GPU so more cool air coming in the front and sometimes bottom intakes can flow to, on back and out of case. Yea, airflow issues aside, a flap of cardboard inside a PC is a really fantastic idea. Google the quotes I gave you. I CBA to go through all that again. November 2018 in one of the RMA threads, IIRC... I'll bet it was a Corsair model, too. OCUKers don't go in for AIOs as much as they used to. Most recent posts are about people not wanting to repeat that mistake, or make it in the first place. All made by Asetek, I believe... ? Edit: Yup, as I thought. Plenty of Asetek coolers around advertised as AIO's. Dear me. Right, right... and I suppose there are no actual Volkswagens around, as they're all advertised as "Cars", yes? Anyway, you realise that most people don't care what you call them, right? Guess you're not "most people", then? You clearly don't understand what I post. There are plenty of AIO advice threads on the 1st page of the water-cooling forum and no-one has laughed them out at all. It's all in your head. PS Jesus Christ isn't the Christian god. That's the big fella in the clouds, not the little fella on the cross. 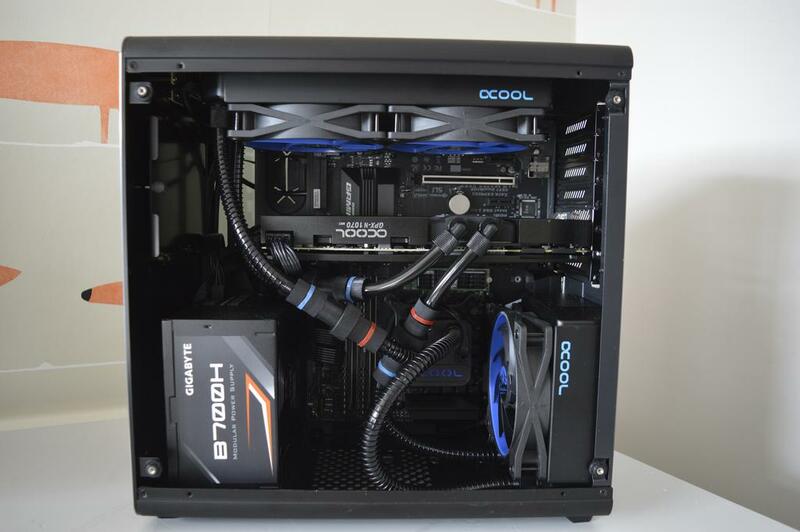 I stand corrected, you are correct water cooling forum is not laughing CLCs out. But your other claims of number of leaks/failure are not at all accurate. As for JS you are a total ... never mind, it's obvious to anyone reading this that your prespective of things is hardly realistic, and your last sentence only proves you will not even admit you cursed by taking the name of Christian god in vain. Seems you are simply unable to admit when you are wrong. I'm trying to understand why you would make such a wild and easily disprovable claim: that "AIO coolers are laughed out of the water-cooling forum". I'll tell you what will get laughed out though - suggesting people stick cardboard flaps inside their PC like you did. I picked the 280 CPU because it has a fill hole. So the last thread detailing an AIO failure is way before the last thread detailing a custom loop failure? You repeatedly specified 'leak', not failure, but as you'll know from reading the threads pump failure is by far the most common issue on AIOs. You'll also find custom loop issues more common because they're down to the user, hence them asking what they can do to fix it. When AIOs fail, especially CLCs, most people don't bother posting any more and just raise an RMA. Case in point - My own CLC failed. I didn't even bother RMAing it, let alone posting a thread on it. By your logic, that lack of post means it didn't fail, though. "corsair and bequiet have good rma/customer service - alphacool not so good , but your first port of call would be OCUK/reseller anyways"
Why would Orbital even mention who has good RMA, unless failures were common enough to actually be a factor in model choice? Doesn't do much for your "AIO's will kill your PC but a custom loop won't" argument does it? How fortunate for me that I wasn't arguing that, then, eh..... nor half the other things you seem to be contesting. Perhaps re-read what has been said, rather than arguing what you think has been said? 1) A leak is a failure. And had I posted a pump failure (which is still a failure), you'd have bitched about it not being a "leak". 2) If you weren't arguing that AIO's are more likely to kill a PC than custom loops, what did you mean by this? You were struggling to see why something that's "just a cooler" was of such concern to some people - My point is that they spend loads of money on swanky PCs, so why would they then entrust the very essential cooling for that PC to a device that's been manufactured to a price point, is sealed so cannot be maintained if it starts to deteriorate, and has only the possible recompense of a warranty that may or may not cover their specific circumstances? If anything, I'd argue that those buying AIOs because they're on a budget would be better off with air cooling, as custom loops are way above their price bracket. You've lost me on point 1 I'm afraid, but anyway on to point 2. I've nothing more to add to what I've already said. You're scared of AIO's for reasons I don't understand and I'm not because I hardly ever see anyone complaining about them failing. Can I suggest we leave it at that? I'm surprised you haven't drowned already. This thread is a trainwreck. If you love AIOs or custom loops, don't wade in to a thread and spent 200 posts trying to convince everyone else they're wrong. Locked whilst I clean it up. H115i and NH-D15 have similar cooling abilitys, so if your temps with D15 were much higher just watching videos there was something else wring, like your case was not flowing air like it should or you cooler fan speeds were too slow. There's only 1 degree difference between D15 and D15S so that really doesn't explain it. If temps were higher than 62C just browsing then something else was evidently going on. However, if the H115i works out better for your circumstances then well and good. H150i on a 9900k @ 5ghz all core @1.32v, maxing out on AIDA around high 70s after 1 hour. I'm happy with that. Thermal Grizzly paste though. Same answer as before. If when using NH-D15S CPU temp is radically warmer than with H115i it's an airflow issue, either cooler fan is running to slow or case fans are too slow / not able to supply enough cool airflow to cooler. Review in below link shows their performance to be near identical.